Pool Trading BV is an international wholesaler supplying maritime and industrial markets with used (pre-owned) diesel engines, generator sets, gearboxes and parts. Our team consists of 12 enthusiastic and highly skilled specialists. 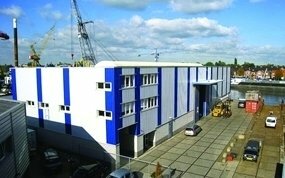 Our office, warehouse and workshop are located in Sliedrecht, The Netherlands. It is our mission to be recognized as Europe’s most reliable, stock keeping supplier of good quality pre-owned equipment. Pool Trading BV was founded in 1994 by Mr. Dirk Blom and Mr. Henk de Koning. Both Dirk and Henk have their roots in the engine and shipbuilding industry. The company has known a steady growth and is now recognized by a vast network of suppliers and customers for being a reliable tradepartner in used equipment. In 2013, the company was taken over by Mr. Erik Boomsma and is lead into a new stage of further growth. Our team monitors the world market continuously in order to buy high-quality (pre-owned) engines, generatorsets and gearboxes. By doing so, we anticipate future demand and the technical specifications in the market. We procure through a network of respected suppliers and individuals. Each engine or gearbox is systematically inspected and test-runned. The eventually necessary repair and/or reconditioning takes place in our workshop. We stand for supplying our customers with a quality product and good value for money! Our team members are highly dedicated, skilled and motivated to ensure the delivery of excellent running equipment. In our workshop, they take care of your engine. From standard maintenance to a complete overhaul to spec. Our skilled team stands behind every repair and reconditioned unit. Our warehouse stock consists of hundreds of engines (mostly in the range 200 to 2,000 HP), generator sets and gearboxes. As well, we stock thousands of new and used brand name parts, like: Detroit Diesel, Deutz, MWM, MAK, Caterpillar, Cummins, Volvo Penta, Scania, MAN, Twin Disc, ZF, Masson. Save time and money! We either have it in stock or we know where to get it fast. Our knowledge of buying and selling used diesel engines, generator sets, gearboxes and their parts, can help you get the right unit, at the right time and at the right price. Our customers keep returning to us because we listen and act on your needs. For us, customer service is of utmost importance and our professional sales team will provide you with technical and practical advice. This service also includes efficient handling of the related formalities. Exporting outside of Holland is not a problem for us, especially customs clearing. Thanks to our many years in business, Pool Trading knows the ins- and outs of the myriad of international laws, rules and regulations.